Toggenburg Goats of Arizona is dedicated to providing natural and healthy artisan goat milk products to our local community and visitors. Our goats are our family, and we continually strive to share our passion about goats and goat products with others. Our Florence-based company offers farm fresh artisan goat cheese, handmade all-natural soaps and lotions that sooth and moisturize skin. Our delicious chocolate goat milk fudge is "to die for." Visit Our Goat Products page for details and to purchase our products for your enjoyment. 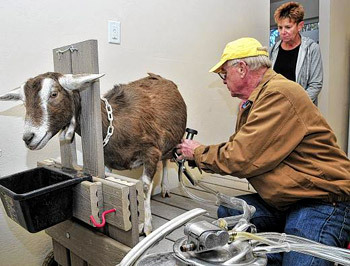 If you are interested in seeing the Toggenburg goat farm in Florence, please contact us and we will reserve a tour spot for you and or your group. Our tour will show you how our farm works. You will meet our goats and sample our products. If you visit the farm in February and March you will see new born baby goats (kids). The Eatons have added a farm product store to their farm. Customers can purchase all the products produced and made on the farm at this farm store. See Tour & Store page for additional information. For more information please contact us, call (928) 246-7865 or send an e-mail to bob2582susie@yahoo.com.